We’ll have wait until December 18 to meet a bunch of new characters in J.J. Abrams’ Star Wars: The Force Awakens, and while there are a handful of familiar faces waiting for us there as well, the animated Star Wars Rebels on Disney XD has been holding it down on that front. They’ve already brought back Darth Vader, Yoda, Obi Wan Kenobi, Lando Calrissian, and others. And the hits just keep on coming, as Grand Moff Tarkin makes an appearance on the show, which you can check it out in this clip from the episode “Call to Action” below. We know that most of the key players from the original Star Wars trilogy are all coming back in J.J. Abrams’ upcoming Star Wars: The Force Awakens. Han, Leia, Luke, Chewbacca, R2-D2, and C-3P0 all show up later this year when the first film in the post-Disney era of Lucasfilm drops on December 18. For all of the other characters we want to see, however, it looks like we’ll have to keep tuning into the animated Star Wars Rebels on Disney XD. And they added yet another classic cameo to the mix, Billy Dee Williams as Lando Calrissian. According to the website Big Shiny Robot (we can certainly get behind that name), Williams and his smooth-talking, mustachioed space rogue show up on the next episode, entitled “Idiot’s Array.” The story revolves around Zeb, the big, tough, weird looking muscle of titular group of rebels, who gets into a game of Sabacc with a well known space gambler (guess who), and loses their astromech droid Chopper. 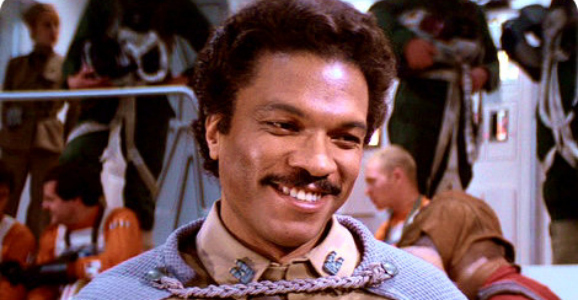 Never get into such a contest with a dude who looks as overly confident as Lando, that’s just rule number one. From there, they crew of The Ghost gets into some hot water with a group of gangsters (Hutts maybe?) and adventures ensue. Here’s a screenshot of what a youthful Lando looks like.